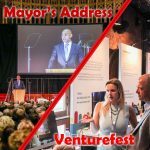 Evans Audio Visual Staging’s success at Bristol Events - Evans Audio Visual Staging Ltd.
Evans Audio Visual Staging recently supplied its expertise to a further two successive Bristol-based events, Venturefest and the Mayor’s Annual Address. Venturefest is a wide ranging programme of events showcasing technological advances and exploring the opportunities and barriers to creating a truly Smart City. The Bristol/Bath events culminated in mid-October at Bristol’s Watershed, where Evans was on hand to supply scenery and graphics to compliment the Watershed’s in-house technology. Due to the tight turnaround times, Evans worked closely with the venue to ensure a quick load-in and load-out, enabling Venturefest to run smoothly and not interfere with the Watershed’s wider programming. The following day, Evans supplied the Mayor’s Annual Address at the Wills Memorial Building. This event required a drape set, rear projection screen with a live camera feed, autocue, lectern, tables and chairs. Evans also provided microphones and radios to interface with the in-house PA and a lighting system for the stage. The Evans team worked closely with the design manager at Bristol City Council to ensure the successful delivery of the Mayor’s Address, which was part of the Festival of Ideas and was simulcast on Ujima Radio in addition to being filmed and subsequently broadcast on YouTube.